On Jan. 1, 1.1 million low-wage workers in Ontario greeted 2018 with the promise of a better paycheck. As part of Bill 168, passed by Ontario’s governing Liberal Party, the province’s minimum wage jumped from $11.60 (CAD) to $14 per hour, and it will rise again to $15 in 2019. The increase comes after a significant push by workers and activists, especially those in the Fight for $15 and Fairness campaign, a diverse coalition including labor advocates, unionized and non-unionized workers, and faith communities. It will come as no surprise that Canadian economists are divided on the benefits of raising the minimum wage, but proponents say the hike is desperately needed following decades of wage stagnation that has led many Canadians to take on significant debt. Among those different groups was a coalition of faith leaders who signed a statement supporting the wage increase and a number of other labor reforms, some of which also made it into Bill 168. Ms. Ladd says the faith community was mobilized when organizers in training with the Workers’ Action Centre began to think about how to expand the fight to their own personal networks. “I would say probably 60 percent of [trainees] were part of faith communities,” says Ms. Ladd. “They went to their local mosques or churches or otherwise, and more than just listening and telling people about the campaign, they asked their faith leaders if they would support it and put on workshops.” To see a multifaith community come together with workers in health care, transportation, food service and other industries was unique and exciting, Ms. Ladd says, and helped galvanize the movement. A report from the Canadian Centre for Policy Alternatives, a research group that has been studying income inequality, says if the minimum wage had been $15 at the beginning of 2017, it would have meant a raise for 23 percent of Ontario’s population, including 27 percent of women and 19 percent of men in Ontario. The report says an increased minimum wage in the province will especially benefit immigrants, indigenous and other low-income workers. Of course, the wage hike has not been welcomed by everyone. A number of businesses have started to eliminate benefits previously granted to low-wage workers, most notably the popular fast food chain Tim Hortons in response. 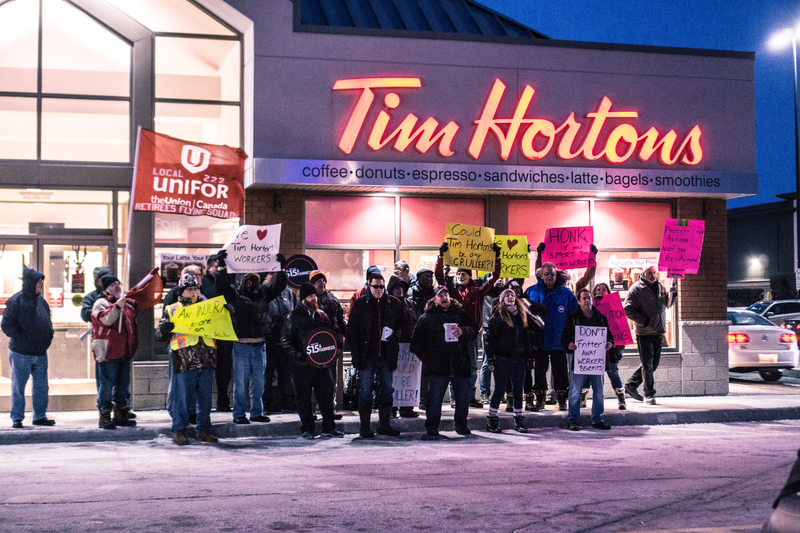 Reports of Tim Hortons franchisees rolling back paid breaks and prohibiting employees from accepting tips led to protests in Ontario and across Canada throughout January. Despite the province providing a tax cut to small businesses to offset the effects of the wage, some have described the increase as a “small-business killer,” as well as the cause of price increases at some businesses. Starting a niche business in a city increasingly known for high rent and a high cost of living is daunting, but The Sidekick has become a neighborhood staple, and though it means payroll expenses will go up, Ms. Watton is unfazed by the change. While some businesses have aggressively opposed the change, a Forum Research poll said two-thirds of Ontarians support the wage increase. With the eventual goal of $15 per hour, Ontario joins Alberta, which passed legislation to raise its minimum wage to the same level, effective in October of this year. The two provinces will have the highest minimum wage in Canada. Bill 168 is a major victory for workers and the Fight for $15 and Fairness, but Ms. Ladd says the fight is far from over. Now, she says, organizers are focusing on informing workers about their new rights they have and about how to protect them moving forward. On June 7, Ontario will hold provincial elections, and the Canada’s major parties are already weaving Bill 168 into their campaign narratives. The Progressive Conservative Party says it would delay the wage increase until 2022, while the New Democratic Party is critical of what it suggests is opportunism behind the Liberal Party’s support for the raise. The incumbent Liberal Party is touting Bill 168 as a matter of moral responsibility, and the policy is popular with voters who only last year gave Kathleen Wynne, the Liberal Ontario Premier, a mere 12 percent approval rating. Will this mean less jobs for low income workers? Just 50 miles south of Toronto, McDonald's has introduced kiosk ordering eliminating many low income jobs. Robots are making better tasting hamburgers than humans in trials elsewhere. Will these innovations make it north? Despite low unemployment in the US, there is not enough work for the people of the world. Farming was the main provider of jobs but farming is so mechanized now that most farm jobs have been eliminated as we produce even more food worldwide. Over 75 percent of the job losses will occur in California and New York. Dean Dettloff is America's Toronto correspondent and a junior member of the Institute for Christian Studies.